I’ve been a quiet since leaving Brazil, but I want to catch everyone up on the adventures around the world. Leaving Rio and the mystifying Portuguese language I traversed over South America, from the Brazilian Atlantic Coast to the Pacific Coast of Chile, and the at least more familiar Spanish language. On my flight from Rio de Janeiro to Santiago I sat next to two giggly Chilean gals who had been taking a vacation in Rio. We chatted a bit in some very bad Spanish and English but managed to have a fun trip. Very fortunately though, landing after 10:00 PM, they arranged for one of their friends to give me a ride from the airport. This was crucial since the metro was closed and I had no idea how I was going to get to where I was staying. I started out Couchsurfing with Ignacio, a 24-year-old Chilean IT guy, entrepreneur, outdoorsman, strength and endurance athlete and pretty funny guy. Here are the keys, come and go as you please, totally chill. His roommates Cristian and Victor were cool cats too although I didn’t see them quite as much. New city SOP: SIM card, diccionario, el plano por un metro y la ciudad and a free walking tour. No hay problema. Ignacio took me to a small party with some friends one night where we spoke only Spanish, and on this night it seemed like I could understand and get by fairly well. It’s been interesting. I’ve found in many cases that I can actually understand what is being spoken; I sometimes have to stop and think and process the words for a few moments, but suddenly the lightbulb will click and I’ll think hey, I know what you said! I’ve learned over time though that it’s really hit and miss, and more often I can’t understand but a few words in a conversation. Sometimes I think I might actually learn it and be able to speak Spanish. Other times I think it’s hopeless. I found Santiago to be nothing spectacular at first; most wouldn’t consider it a “beautiful or magical” city, but after spending time there and getting to know it better it really grew on me. I did a walking tour, spent some time going around on my own, did a few hikes and took a day trip into the beautiful pre-Andean Cajón del Maipo canyon. I also met up a few times with one of the gals from the flight. This was actually great because she doesn’t speak a lick of English and I was forced to communicate in Spanish the entire time. Having picked up a Spanish-English dictionary it was often a process of catching some words, looking up others and piecing together a conversation. This was excellent learning and pretty fun; in retrospect I wish I would have kept it up because I’d be better off by now. Having been following Ashley’s blog for most of this year, I came across a blog post that mentioned Santiago, Chile and their almost-famous terramotos. Realizing I was in the same city as her, I introduced myself and suggested we meet up. As it turns out Ashley has lived between Chile and Costa Rica for years, having been in Santiago during this stretch for over four months. Being an official local and fluent in Spanish she showed me around some of the cool places in Santiago, introduced me to a bunch of her friends and gave me a sense for the place that I wouldn’t have gotten otherwise. I asked her a lot of questions about her business and philosophy, and in the process learned about her pretty incredible success story. I felt encouraged by her attitude and ability, and actually meeting and talking with someone who has made it for themselves has reaffirmed my belief…that I can do it. I can make it on my own. And that that’s what I’m going to do. I spent about a week in Santiago before heading down south to Puerto Montt, an old port city in the southern Los Lagos region of Chile. I spent a week in this region as well, going around Puerto Montt with its excellent market of homemade crafts, small beaches littered with dilapidated fishing vessels and bustling seafood markets. I also visited the much prettier Puerto Varas 20 kilometers to the north on the shores of the Llanquihue Lake, then hitchhiking east to Ensenada and eventually into the Parque Nacional Vicente Pérez, first the immensely powerful Saltos de Petrohué waterfalls and then the Largo Todos los Santos. From here you can actually take a boat to the other side of the lake and cross into Argentina, which many travelers do. PS: hitchhiking in Spanish was fun and adventurous. Another day I hitchhiked to the Alerce Andino national park for an unfortunate seven kilometer walk from the street before actually entering the park, which limited my time there pretty significantly. On a stroke of luck I was able to hitchhike most of the 7K back out and all the way back to Puerto Montt, saving me at least two hours and 500 Chilean pesos, which is over $1. Back at Perla’s hospedaje (like a hostel but kinda like staying in someone’s house), my cold but cozy home in Puerto Montt, I watched the disappointing games 1 and 2 of the National League Division Series and the Giants falling behind 2-0. Finally I made a trip out the large Pacific island of Chiloé and its northernmost city of Ancud, the island being famous for its seafood and historic wooden churches. I got a chance to visit the museum for said churches which was pretty impressive. Staying at the outstanding 13 Lunas Hostel – seriously, one of the best hostels I’ve stayed at this year – I watched the Giants bounce back in miraculous fashion to even the series at 2-2, before finally watching the decisive game 5 back at Perla’s. hostel followed me almost halfway before falling behind and eventually getting lost; she was found some days later, I was relieved to find out. On my only trip to a restaurant in southern Chile I sat down and ordered a curanto, the famous seafood dish in Chiloé and also a mariscos (shellfish) empanada, not realizing the curanto would be freaking massive and equally delicious. Mmmm. Having enjoyed the slow pace and natural beauty of southern Chile I returned on the 14-hour bus to Santiago. Back for about five days I managed to work a deal for a half-price four-day Spanish course in exchange for some volunteer work, which was invaluable. I learned a great deal and my Spanish took big strides, but also illustrated how much I still don’t know. I feel like if I could take that class for a month straight and speak only Spanish the rest of the day I’d have it; but unfortunately that’s not happening. Also back in Santiago I managed to finally hike San Cristobal, a large hill overlooking the city with some fantastic views to the Andes beyond. For my last weekend in Chile I made the short two-hour journey to Valparaíso, the once-famous and internationally renowned City by the Sea. During its golden years beginning with the California gold rush, “Valpo,” as cool people call it, or just “VP” as I call it, was an important and bustling port town for those stopping on their way to making their fortunes in California. The construction of the Panama Canal, though, would nearly ring its death knell as a vast majority of traffic was rerouted, skipping VP entirely. 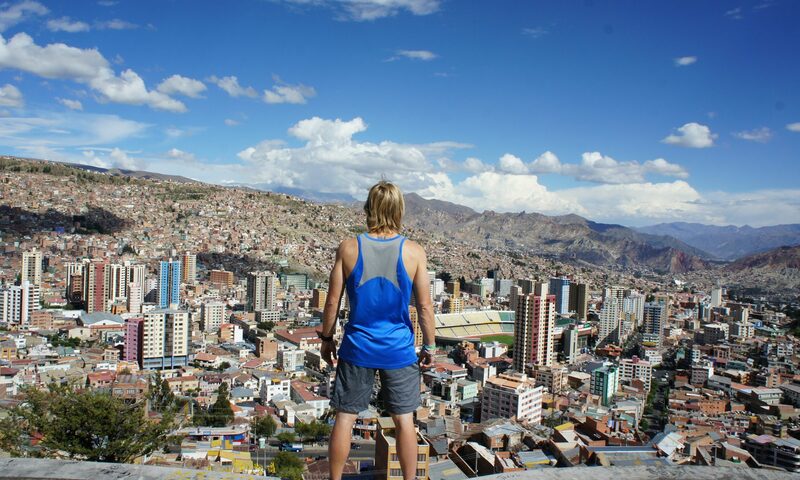 Over the decades the city fell from grace, and has since become the most impoverished city in Chile. However, recent years have brought about a recovery as VP has shifted more of a focus on tourism as its primary industry. Today it really is beautiful. With its hills and neighborhoods, historic “ascensors” (elevator-carts that ride on tracks up the side of many hills in VP), age-old micros (local buses) still operating, and covered in the most amazing street art I’ve ever seen. Too short, but awesome time in the VP. I found Chile to be nothing overwhelming or incredible, but looking back now I really had an excellent time there. With the outstanding infrastructure of a highly developed nation it was easy to get around and pretty comfortable, while at the same time I enjoyed the slower pace and really just being in Latin America. After VP I spent one last night in Santiago getting ready for Argentina..